Dubbed the ‘Jewel of Macedonia’ and ‘Jerusalem of the Balkans’, Ohrid is a city that hums to an unusual rhythm and bristles with exotic beaches, Balkan magnetism and historical mystique. With over 38,000 residents, it is the largest city on Lake Ohrid. Popular attractions include the Church of St. John at Kaneo, Lake Ohrid and Tsar Samuel’s Fortress. Get ready to explore this quaint Macedonian masterpiece with cheap flights to Ohrid! The hub airport of Ohrid is Ohrid "St. Paul the Apostle" Airport (OHD), which is a 15-minute drive from the heart of the city. 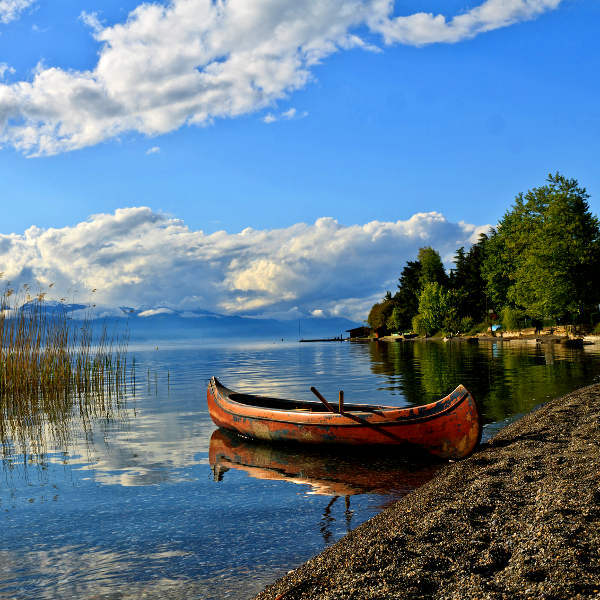 Surrounded by Mount Petrino and Mount Galicica, Ohrid lazes on the shores of Lake Ohrid, a magnificent expanse of shimmering emerald water that has existed for almost three million years. Once home to 365 churches, one for each day of the year, Ohrid is synonymous with the divine. Notable chapels are the Church of St. Sofia, Church of Saints Clement and Panteleimon, and St. John at Kaneo. Ohrid is one of the oldest human settlements in Europe. The old cobbled streets, medieval churches and traditional architecture offer a mesmerising glimpse into a world of exotic Macedonian antiquity. Ohrid experiences a humid subtropical climate with significant rainfall throughout the year. The best time to visit Ohrid is between May and October. These months offer warm temperatures, dry landscapes and a number of cultural events. Although the city becomes a ghost town in winter (December to February), the snowy landscapes are absolutely breathtaking. Notable events include the Balkan Folklore Festival and Ohrid Summer Festival in July and Balkan Music Square in August. For cheap flights to Ohrid, the best time to visit is in winter. 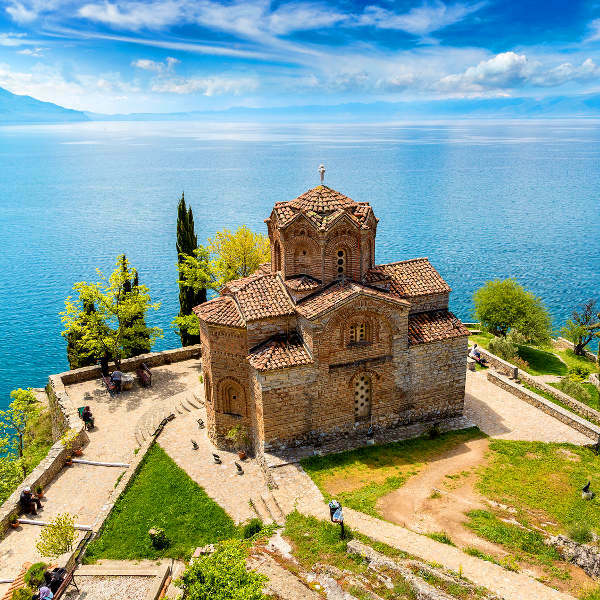 Ohrid is a place that will lure you off the beaten track with the seductive rhythms of flutes and fiddles and show you a world that is as charming as it is peculiar. Surrounded by majestic mountains and the oldest lake in Europe, and known as the ‘Jewel of Macedonia’ and ‘Pearl of the Balkans’, Ohrid is a sassy city that hums to its own beat. It is a patchwork of Balkan, Mediterranean, Greek, Roman and Ottoman heritage and a UNESCO World Heritage Site. Synonymous with churches, the city was once home to 365 chapels and cathedrals. And while the number has waned dramatically, a number of sacred structures can still be found throughout the city. The Church of Sveti Jovan at Kaneo and Church of Sveta Bogorodica Perivlepta are iconic. The Ohrid Bazaar is a pedestrian street lined with Macedonian marble, ice-cream parlours, and boutique stores, while the waterfront is a seductive strip of al fresco restaurants and cafés. 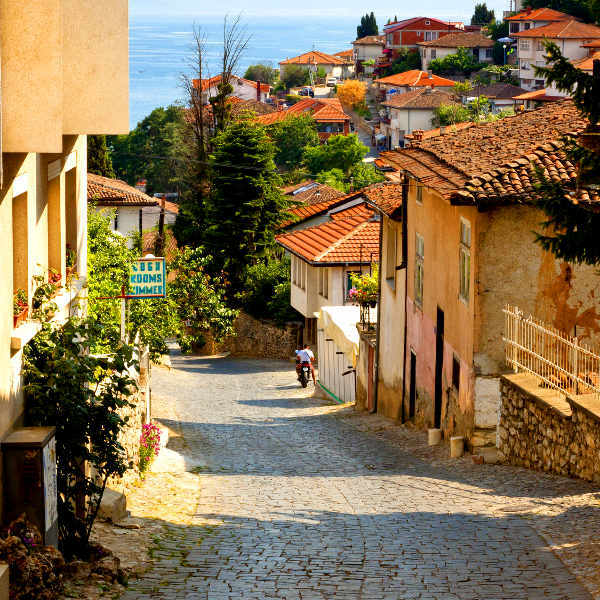 For a glimpse into old world Ohrid, wander through Old Town, a charming tapestry of Ottoman houses and cobbled streets. Compare several airlines and book your cheap flights to Ohrid online at Travelstart! Ohrid is a safe city. However, it is still recommended that you take the usual precautions and use common sense throughout your trip. Travel insurance to cover theft and medical expenses is recommended. You should carry a copy of your passport at all times. Petty crime is rare, but it can happen anywhere. Avoid leaving valuables and personal belongings unattended and wandering around with large sums of cash. Public demonstrations and political gatherings should be avoided. Earthquakes occasionally occur. Follow the advice of safety officials in the event of a natural disaster. You should familiarise yourself with the local laws and customs. Proof of yellow fever vaccination is required if you are travelling from an infected country. Mosquito-borne diseases are present in Macedonia, so precautions should be taken to avoid bites. Vaccinations for hepatitis A & B rabies are recommended. Routine vaccinations include MMR, diphtheria-tetanus-pertussis, meningitis, varicella, polio and influenza.